This is a fun way to get students to read and practice whatever point you are working on. Instead of the traditional Battleship game, which has guesses such as "A6, C5, etc." this one involves combining sentences, and the students must listen to get the right square. To guess a square, instead of "A6," the student might say, "Hassan is skateboarding to the zoo." "C5" might be, "I am going to school." Print two copies of the grid for each student and put them on old file folders, so that one is flat on the table, and the other is vertical in front of the student. The students take a few minutes to put in their "ships" with X's in adjacent squares. Once they are ready, they start playing. They are trying to guess the location of their opponent's "ships". Once they guess all the squares of a "ship," it is sunk. 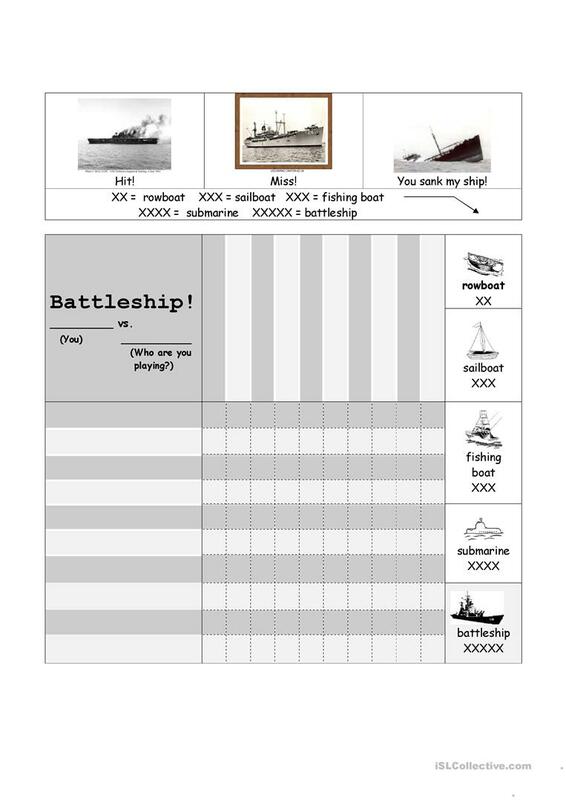 The first person to "sink" all of the ships wins! This downloadable teaching material is intended for business/professional students, high school students, elementary school students and adults at Elementary (A1), Pre-intermediate (A2), Intermediate (B1), Upper-intermediate (B2), Advanced (C1) and Proficient (C2) level. It can be used for developing your pupils' Listening, Speaking and Reading skills. KathyPW11 is from/lives in United States and has been a member of iSLCollective since 2012-09-28 02:10:11. KathyPW11 last logged in on 2019-01-25 22:33:18, and has shared 1 resources on iSLCollective so far.